Glastonbury Festival of Contemporary Performing Arts needs no introduction; it’s is the largest open-air festival in the world. Needless to say, we’re huge fans, just check our coverage of the 2009 festival. Each year a competition is held to give a talented, unsigned artist the chance to perform on the world famous Pyramid Stage in front of a crowd of (potentially) thousands. This year, Michael Eavis and co. have changed the format of the competition to include a panel of 40 bloggers from across the UK which will whittle down the hundreds of entries into a shortlist ready for the live final. 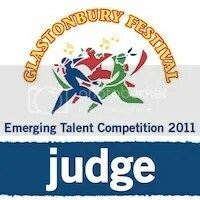 As you might have seen from the banner on our home page, we’ve been invited to take a place on the judging panel. We’re honoured and fully supportive of the aim to get as many quality acts to enter as possible. If you’re in an unsigned band or solo act, or know someone who is, then please enter the competition. You never know, you could be playing on the Pyramid Stage like so many greats before you! For the 2011 competition, acts will be able to enter FOR ONE WEEK ONLY from 9am on Monday, 10th January until 5pm on Monday, 17th January 2011 right here on the official website. Entries for ETC2011 will be FREE. To enter, you will simply need to supply us with a direct link to a web page where we can hear at least one of your songs (MySpace, official site, YouTube, SoundCloud etc). This entry was posted on 10 January, 2011 at 7:27 pm and is filed under Features with tags emerging talent competition, glastonbury, UK. You can follow any responses to this entry through the RSS 2.0 feed. You can leave a response, or trackback from your own site.